Hughes and Salvidge were the Principal Contractor for demolition works at Centenary Court, Basingstoke. The project consisted of a comprehensive soft strip of the buildings including removal of furniture, fixtures and fittings, the removal of bicycle shelter and planters, demolition of all existing structures, foundations (to a depth of 1.5m), drainage, redundant services, concrete slabs and external hardstand areas up to the edge of existing tarmacked areas, backfilling all excavated areas with crushed material, and the disposal of waste materials arising from the demolition works. Our programme of 6 weeks worked around several restrictions on site. The power to the building was live at the time of commencement; therefore, operatives were only permitted to remove loose items i.e. office furniture and general loose items until the power to the site was isolated. 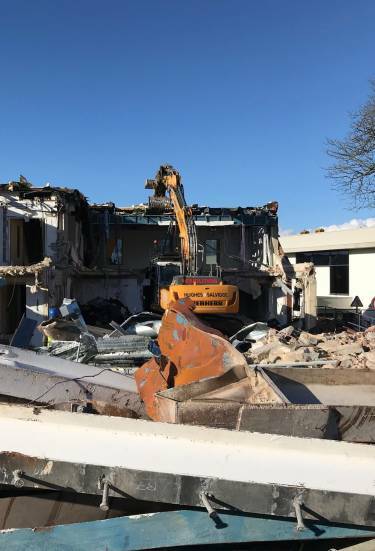 SSE attended the site to isolate and disconnect the mains power to the premises. The disconnection certificate from SSE was held within the site office for all operatives to see. Hughes and Salvidge made ourselves known to any other contractors working near our site and created and maintained adequate and safe segregation from others. Close communication was maintained to ensure the smooth running of both projects.